This project is designed to reduce disease and save lives by installing a coordinated system of hygiene instruction and water filters in 16 schools located in Metropolitan PAP, Haiti. Haiti also has the largest cholera epidemic in the world. Started in October 2010, it is the direct result of lack of access to clean water, safe hygiene and sanitation. The already poor infrastructures were disrupted by the earthquake and created an environment whereby the introduction of cholera into the water supply resulted in a rapid cascade of events creating an epidemic. Experts predict another year before case numbers are low and stable and that each year there will be spikes during rainy seasons. Currently 35,000-45,000 cases diagnosed each month; 5 % of the population has been diagnosed. Overall, 500,000 people have been diagnosed with 6,000 deaths. Pure Water for the World, Inc. (PWW) schools program focuses on ensuring clean and safe water to schoolchildren and providing them with a curriculum that focuses on water and sanitation hygiene consistent with established guidelines. This validated social policy of teaching health and safety in schools and then encouraging students to carry the messages into their homes and neighborhoods is a cornerstone of the extraordinary results that our programs enjoy. Implementation of clean water programs has consistently been shown to decrease diarrheal disease in children by up to 45%.2 The PWW water and education programs in Haiti have demonstrated direct evidence based improvements for over 200,000 children in the areas of increased school attendance, decreased diarrheal disease and improved hygiene behaviors at school and in the home. 2.Fewtrell, L.; Kaufmann, R. B.; Kay, D.; Enanoria, W.; Haller, L.; Colford, J. M., Jr. Water, sanitation, and hygiene interventions to reduce diarrhoea in less developed countries: a systematic review and meta-analysis. Lancet Infect. Dis. 2005, 5 (1), 42–52. At the end of this project, 16 schools will receive safe water and hygiene education, 32 teachers and principals will be trained and an estimated 6,000 children will have clean water to drink. 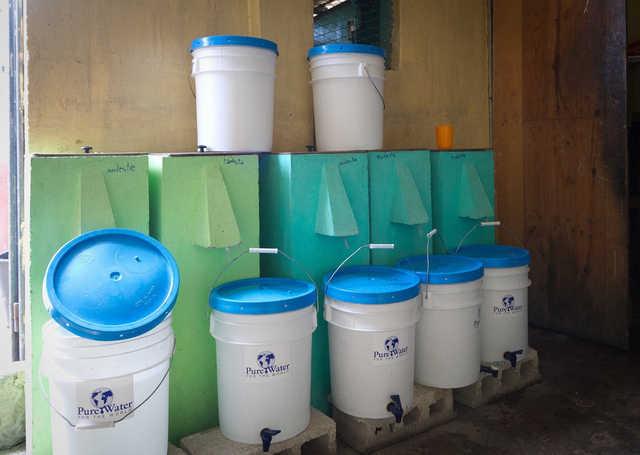 This project is designed to reduce disease and save lives by installing a coordinated system of hygiene instruction and water filters in 16 schools located in Metropolitan PAP, Haiti. Pure Water for the World, Inc (PWW) has worked in this area before and while much has been accomplished, there is much more to be completed. These schools have been selected for implementation of a safe water and hygiene education program. Pure Water will install “Point of Use” biosand filters in each school at a ratio of one filter to seventy five students and will train at least two teachers from each school to implement a water and sanitation hygiene education curriculum in the schools. 1. Ensure that children have access to safe drinking water. 2. Ensure that children receive critical messages about water and sanitation hygiene. 6. Establish a sustainable “Point of Use” water delivery program in 16 schools reaching an estimated 6,000 children. The sustainability of a water project is another critical element to its long term success. Factors influencing sustainability include: efficacy in removing pathogens from a variety of water sources, ease of use and quantity of water produced, ongoing costs, reliability of the technology and post implementation continued use. Biosand filter (BSF) technology is used by over 1.5 million people worldwide. The efficacy has been demonstrated in a number of studies, the filters require minimal maintenance, are easy to use and they have no associated ongoing costs. Point of use water treatment has been adopted by the government of Haiti as its long term solution to increase access to potable water. Point of Use water treatment is a priority intervention by both the World Health Organization and UNICEF. An effective intervention to reduce disease and save lives in Haiti is with the adoption of safe hygiene and access to clean water. The keys to reducing disease and saving lives in developing nations are not technology and money. They are education and behavior change. Education and behavior change do not happen overnight. The microbe theory of disease and the hygienic practices necessary to avoid disease are new things to be learned, and these are not consistent with the cultural practices in many developing nations. Centuries-old habits are not easily replaced by modern practices. While hygiene and clean water can essentially stamp out common waterborne diseases, immediately, developing the changes in behavior that will consistently produce that result takes time. These are not short-term challenges. Students will learn the basic hygiene and sanitation practices required to avoid disease, and they will drink clean water. Their behavior can be monitored. The keys -- education and behavior change. Students then become advocates in their homes and communities for improved health practices. 3. Curtis, V. and Cairncross, S. 2003. Effect of washing hands with soap on diarrhoea risk in the community: A systematic review. The Landet Infectious Diseases, Vol. 3, May 2003, pp. 275-281. 4.Sobsey, M. Biosand filter reduces diarrheal disease in Dominican Republic village. Preliminary report released by U. of No. Carolina, School of Public Health, Mar. 19, 2007. At least two teachers or principals from each school will attend PWW's 2 day hygiene training workshop. These teachers will then be equipped with the hygiene educational materials that they need to pass this training on to their students. This project will serve students, and in many cases their families, with safe water, hygiene education and the means to improve their lives. With the opportunity to better their health, children will be able to attend school more frequently, and are empowered to improve their lives overall. The gift of one of the most basic human necessities, safe drinking water, will drastically enrich the lives of children and their families; because of this, they will live happier, healthier lives. Providing teachers and students with the means to improve their hygiene habits will improve their health overall. As mentioned before, it does not happen overnight thus PWW provides them with the tools to continue this education, as well as a sustainable system for safe drinking water. PWW will monitor filter maintenance, safe water storage and the practicing of proper hygiene habits ( hand washing, etc,). These assessments will take place 3 times over the course of a year at regular intervals. The filter used here is similar to that used in rural Guatemala. The homes that have these filters indicate that they can get about 3-4 galons of water a day if the charge them with water in the evening and let set over night. According to the budget for the project the 64 filters will serve 6000 students or about 94 students per filter. The filters will produce about 15 liters ( 15,000 ml) per day which amounts to about 160 ml per student a day. This is about 1/2 a PEPSI bottle per student a day. Check my figure, but is this sufficient for the project goals? Friends in Haiti have indicated that this is a pressing need. Should your ratio of water per student and numbers of filters be increased? A cleaning process is necessary to keep the fliters functioning properly. Please describe your method for cleaning the filter and how often this needs to be done in your climate zone. Thank you for your review. Below is information provided by our staff in Haiti. Let me know if you have any other thoughts or questions regarding this. Thanks! The biosand filter produces 400 ml per minute with a one hour rest period between charges. The schools charge the filters with 20 liters of water 5 times per day, yielding 100 liters per day per filter or 400 liters per day per school. With the average enrollment of 400 students per school this provides one liter (1000 ml) of drinking water per student per day. The outlet tube will become contaminated during normal use and can be cleaned regularly with soap and water or a chlorine solution. The inside of the treated water storage container is to be cleaned when it looks dirty or at least once a month with soap or a dilute chlorine solution and rinsed with filtered water. Chlorine cannot be poured into the top of the filter – it will kill the biolayer. The flow rate through the filter will slow down over time as the biolayer develops and suspended solids are trapped in the upper layer of the sand. Users will know when the “swirl & dump” is required because the flow rate will drop to an unacceptable level. The filter is still effectively treating the water at this point; however the length of time that it takes to get a container of filtered water may become too long and be inconvenient for the user. Alternately, you can measure the flow rate and if it is less than 0.1 litre/minute, then the “swirl & dump” maintenance is required. This is variable depending on the turbidity of the water and amount of use. In practice it is required 3-4 times per year. 2. Using the palm of your hand, lightly touch the very top of the sand and move your hand in a circular motion; be careful to not mix the top of the sand deeper into the filter. 3. Scoop out the dirty water with a small container and discard. 4. Make certain the sand is smooth and level. First, totally scratch my last post. I am trying to catch up on four projects that I am reviewing and my last comments were intended to respond to PWW’s project in Honderas and not in Haiti…sorry about the confusion. Anyway, congratulations on all your work in Haiti! I enjoyed reading your grant and learning about your work in water and hygiene education. Most areas of your grant are very clear. I do have a concern with the one-month duration indicated on your budget. Based on project budget, it appears as if the whole project cycle lasts only one month. Does this funding only cover one of the three assessments? You mention you have worked in this area in the past. Have you worked directly with the 16 participating schools? If so, what services have you provided to these schools in the past and have the schools been able to successfully sustain these projects? Have any water improvement projects been offered directly to households? As Lynn mentions, the consumption of water per student provided by this project will be fairly low. What is the condition of water outside the school? Again, sorry about the confusion earlier! Thanks! No worries! Thanks for your review! Below is information provided by our Haiti staff. Let me know if you have any other thoughts or questions. The one month duration indicated on the budget is the time to do the initial program hygiene education and filter installation. The follow up will be at 3-6-12 mos. by the PWW mobile training unit established to do program follow up on all projects. We have worked in many schools in the area, not with these specific schools. Our experience with schools is that they are highly motivated for the programs and the continued use rate is very high. Outside the schools: Families in rural Haiti obtain water from springs, rivers, rainwater harvesting, wells or buy trucked non potable water. Those who can afford to, buy potable water from private vendors (about 65 US cents per bucket). PWW balances the number of filters per school with the school's ability to maintain a given number of filters in addition to the enrollment. While more filters would provide more water per student, the schools water supply and/or ability to buy water to treat is very limited. The schools have very small staffs (6-8 for a school of 400 students) and maintaining a large number of filters is neither practical nor feasible. We have through experience arrived at this number of filters to balance a satisfactory potable water production with sustainability of the project. Can you mark the number of people getting water to be zero, since that is normally interpreted as people getting water at home all the time. We want to avoid over- and double-counting. Okay, I've made the changes; let me know if anything else needs to be changed. Thanks, i only wanted you to zero out the "Number of People Getting Safe Drinking Water". The number of school children needs to be 6000 or 6032, not zero! Which brings up a question: 32 staff for 6000 kids? Is that true? Okay, I made the change. There are usually 2 teachers per school. For some of these schools, two sessions are held. So this would mean one group of students will come to school in the morning, and another group in the afternoon. Thus the number of students is that much greater than the number of teachers. Thanks for your metrics info. Is there any other info you can track - attendance, health, ... - that would demonstrate the impact of your work over time? Also, you said you would monitor three metrics for a year. What is your experience in marking the time in which these habits soak in? Here in India, a friend is find out that it takes 3 years of visits at schools for kids and the administration to create lasting traditions. The behaviors and practices that PWW monitors are proxy indicators for the continued and proper use of the filters and of safe hygiene practices. We use these indicators with the assumption (based on data from large well designed studies) that when they are positive then the impact of reducing diarrheal disease will be realized. We do not use school attendance, health records or anecdotal reports as they are extremely difficult to interpret in a meaningful way. We recognize the importance of repeated messages to effect behavior changes so the cornerstone of PWW's education is an intensive hygiene curriculum taught to teachers who then adopt hygiene education into the regular school curriculum ensuring that the children are receiving the messages on a regular basis. I am still grappling with how 1 teacher can handle a 100 kids in a session (6000/32=188 and even 1/2 of that if you have 2 sessions). Much less get intensive hygiene training and even less teach the kids. How high is teacher turnover? How long is your 'intensive' teacher training? And is it repeated? I agree partially with you saying: " do not use school attendance, health records or anecdotal reports as they are extremely difficult to interpret in a meaningful way", but it is possible to be able measure and analyze something to demonstrate impact. How can you monitor "practicing of proper hygiene habits ( hand washing, etc,)" in the first year 3 times and declare success? What exactly are you monitoring and how? Isn't it anecdotal when you step into a class filled with around a 100 kids to measure these habits? Our Haiti staff has responded to the questions below. Just to clarify, 2 teachers per school are required to attend the PWW hygiene training sessions. There are more than 2 teachers per school, however in the cases with the two school sessions per day, that would increase the number of students per teacher. Sorry for the confusion above. The teachers then return to their schools and it is the teachers who teach the hygiene education and safe water use to the children. PWW teaches the teachers how to teach the children about safe hygiene and safe water use.It becomes a regular part of the curriculum. The teachers are provided with curriculum materials and educational poster set (you can see these on cawst.org) Two teachers from each participating school take the course. I am attaching a curriculum outline and training schedule for the teachers. For follow up; projects receive follow up 3 times in the first year. The purpose of the follow up is to measure the acceptance and uptake of the program and to address barriers or challenges that the schools are encountering. It is an opportunity to review the curriculum with the teachers and principals, verify that the curriculum is being taught and to ask questions to children and staff (knowledge, attitude and practice). For example, we ask about handwashing, look for the presence of soap and observe what is practiced. We ask the children about hygiene and safe water use to gauge the effectiveness of the teaching. We inspect the filters to see that they are being used and well maintained and are able to observe the use of the filters. I'm struggling with some of the same concerns that Rajesh mentions. Based on my own experience, I think the project would be a challenge for most participating teachers. How do you select the teachers that take the 2.5-day course if there are more than two teachers per school? Do they receive any incentives for taking the course, or do you hold the workshops during school hours? Does PWW partner with the Department of Education or any other government agency so there participation is recognized and/or the work done in the schools is incorporated into the curriculum, and not considered an “additional workload”? Etta Projects has been working with a Healthy School program for a number of years providing training to teachers as well as school directors and parent groups. Our hygiene education program stretches over a two year cycle working themes from education- (trying to break the traditional ways of teaching so that hygiene and sanitation themes can be introduced in fun, interactive, impactful ways by the teachers to the students) to hygiene and sanitation to values (such as self-esteem in order to motivate students (and teachers) to modify hygiene habits). Like your project states, we learned that this kind of change does not happen. I wonder if a two day training session is sufficient to create the sustainability PWW hopes to achieve. I am also a little skeptical on the project’s ability to impact health, particularly due to the amount of filtered water available per student coupled with the poor quality of water in places outside the school. Do you find the children are changing their drinking habits outside the school as well? Our Haiti staff members do not have access to internet due to Tropical Storm Isaac, so I will try to answer your questions. PWW meets with the principals prior to the project to discuss. The principals then determine which of their teachers or principals will attend the trainings. The workshop is held during school hours and the teachers are paid their usual salary while attending the training. 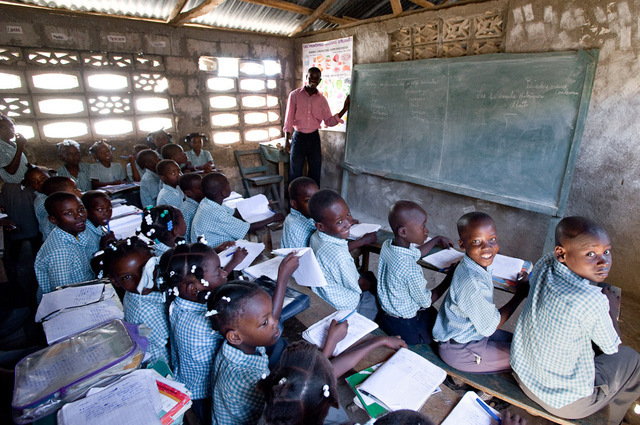 Pure Water provides meals and upon completion they receive hygiene training materials for their school. 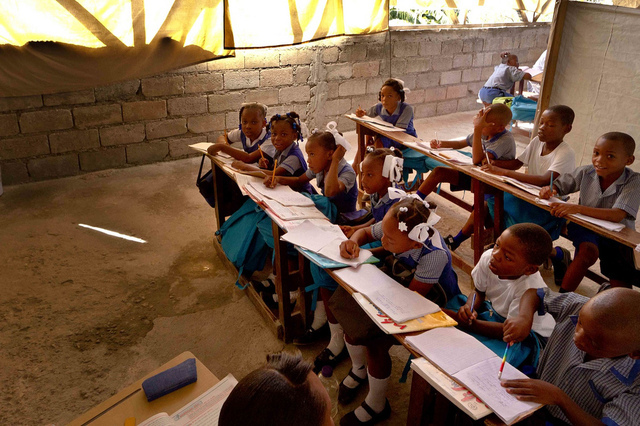 The vast majority of schools in Haiti are privately operated ( organized and run by churches or other organizations) with no government involvement and little to no oversight from the Ministry of Education. The Ministry of Education does not have a strong enough infrastructure in place to implement the hygiene program on their own and they do not recognize the teachers for their time teaching the hygiene materials. There is a lot of data to support that implementing hygiene and clean water in schools impacts the health of children. This is driven by the same philosophy used in American schools that by teaching children healthy habits in schools, the children will continue to practice those proper habits in their homes and communities. By promoting safe water, hygiene and sanitation habits in children at their schools, we can also reinforce their home practices. When children learn important health habits at school, they tend to relay this newly acquired knowledge to parents and siblings at home. This is a funder's dream: clear need, clear intervention, and enough attention to activities such as training and curriculum integration. And today the mantra in the US circles is to start with the kids and watch magic happen in the community. Pictures of school kids and water drops are a bonafide success. Looking at the results of PWW projects in the earlier schools, makes this project less attractive. 16 schools were done but we do not have even the names and locations of the 16 schools, nor monitoring or other reports. Overall, I like this project for the following reasons: First, the geographic span across 16 schools and reaching 6,000 students is a noteworthy ambition for scale and impact. Second, I like that there is a balance of capacity building within each school centered around a uniform approach for clean drinking water. Last, the technology employed is simple, straightforward, low-maintenance and etc. However, I'm still wanting to learn more about the M&E and its correlation to the capacity building approach within the school. I think the results of the M&E, e.g. data, need to influence the "right person/people" in order to further the capacity building/leadership at the 16 schools. Moreover, in terms of sustainability, I think the students/beneficiaries need to be involved in the feedback loop of the data. It's probably alluded to in the proposal, but it wasn't clear to me. Ultimately, if this proposal can actually achieve its objective, then I think the investment is well-money spent. However, I'm still not clear on the mechanics and how it all "fits together" so I want to learn more. My only rerservation concerning this project is the amount of follow up in the schools. Several projects I have visited in Guatemala the NGO staff indicated that the villages need constant reminders and reinforcement to keep the filters in good operating condition. Possibly there is sufficient motivation by the students and teachers to haver clean water, but it would be good to have some information over a long period of time to see if the users maintain the filter after the NGO leaves the sites. Aside from this the information we have received about water quality in Haiti certainly provides ample motivation to support this project. Given the brief duration of the project, the brief capacity building component and the size of the filters, I have doubts that the project can achieve the results stated in the project. It would be helpful to see M&E results that demonstrate project outcomes of past projects.